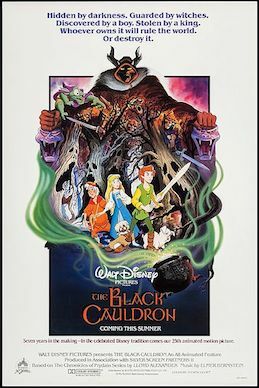 I was too young to see The Black Cauldron, or at least to remember if I actually went to see it. My memory says I did not see it in its theatrical release. If I had, perhaps I would have been frightened by The Horned King and other elements. Having finally seen The Black Cauldron, I think I am more puzzled than anything else. The film looks like it is trying to have it both ways: be a dark story and a cute story simultaneously. Taran (Grant Bardsley) is an assistant pig keeper in Prydain. He dreams of being a great warrior, but for now, he has to watch over Hen Wen, a very cute pig who is to be very carefully cared for. Hen Wen is no ordinary pig: he (or she, I cannot remember which) can see the future. Hen Wen can locate the Black Cauldron, which can grant whoever controls it the ability to rule the world. The Horned King (John Hurt) wants it to bring out his Army of the Dead, and the Horned King also knows where Hen Wen now is. Taran is tasked to keep our pig safe by going to 'the hidden cottage at the edge of the Forbidden Forest', as specific a location as can be found. Needless to say, Taran's daydreaming of himself as a great warrior allows Hen Wen to wander off and get abducted by the Horned King's dragons. Taran decides to rescue the pig, despite the warnings of mischievous Gurgi (John Byner), who looks like a dog and talks like a mix of Gollum and Donald Duck. Taran's rescue attempts fail, but he does manage to help Hen Wen escape. The Horned King throws him into the dungeon, and out of nowhere pops Eilonwy (Susan Sheridan). She says she's a Princess who is also imprisoned due to her bauble, which the Horned King thought could lead him to the Black Cauldron. Exploring a way out of the castle, Taran comes across a sword that has great powers, and they manage to not only escape but help a third prisoner, Fflewdurr Fflam (Nigel Hawthorne), an elderly minstrel whose harp apparently breaks when he lies. The Horned King now searches for them, not helped by his inept minion Creeper (Phil Fondacaro). The trio find the Fairfolk (what we'd call fairies) and Hen Wen. The King of the Fairfolk sends Doli (Byner again) to help them find the Black Cauldron, held by three witches. They strike a bargain: the cauldron for Taran's sword. The cauldron, however, is useless to them, but no matter: the Horned King's army has found them. Now he has the power to take over the world and creates his Satanic army. Gurgi, long a coward on matters, sacrifices himself by throwing himself into the cauldron to stop the army's rise, enraging the Horned King. It's a final battle to the death. Taran, Fflewddur and Eilonwy re-encounter the witches, who are about to take the Cauldron. Fflewddur reminds them they don't take, they bargain, and the witches agree to make a trade: the Cauldron for Gurgi. Gurgi eventually wakes up and all things appear well. The Black Cauldron, as I stated, really is trying to have it both ways: be dark and intense while also being cute and whimsical. It seems to have a rather schizophrenic manner, unable or unwilling to go down one way or the other. Instead, it tries to split the difference, and this uneven tone wrecks the film. The beginning for example is full of cutesy moments, down to Hen Wen's very adorable look. Same goes for Gurgi, even if he looks like a mutt who speaks in Gollem-like gibberish. Other times, it is downright frightening for children. The Horned King nearly beheads Hen Wen, Gurgi throws himself into the Cauldron, and the Army of the Dead rising and crawling through the netherworld would send young children fleeing in terror. I understand that at a test screening, that is exactly what happened. It does not help matters that the Horned King looks like Skeletor's creepy cousin. The conflicting and contradictory manner of The Black Cauldron can be best summed up by the Three Witches. They tried to make one very frightening, the other humorously plump and flirtatious with Fflewddur. It sets up a strange situation in that you don't know whether to take them seriously as villains or as comic relief. Come to think of it, Creeper is a better example of The Black Cauldron's inability to decide what it wants to be. He's obviously menacing and scary-looking, but he also is meant to be some kind of comic relief, the inept henchman to the wicked Horned King. Over and over the film tries to have it both ways and keeps falling over itself. The animation too is hit and miss. The Black Cauldron's great claim to fame is that it was among if not the first Disney animated films to use computer-generated imagery, and there are some scenes that are quite beautiful, such as when the group meets the Fairfolk. The Horned King's realm too is beautifully rendered, the sinister world captured so eerily. Other times though, the animation looks shockingly cheap, such as when the Witches disappear. I think perhaps one of if not the biggest issue with The Black Cauldron, slightly above the contradictory tones or animation stumbles, is that these characters and their situations have no sense of anything. Eilonwy just pops up, and the adaption of two of Lloyd Alexander's five-book series gives her no reason to be. She does not have any defining characteristic: she is not particularly intelligent, brave, romantic or anything. The script also gives a sense that she may not be an actual Princess. When the Horned King captures them, he dismisses them as 'a pig boy, a scullery maid, and a broken-down minstrel'. Taran is a pig boy, and Fflewddur is a broken-down minstrel, but why would The Horned King call Eilonwy 'a scullery maid'? If she was one and not a real Princess, why is it important now? This mention was quickly forgotten, but it makes things a muddle. Fflewddur was there for no reason whatsoever, unless his job was to fret all the time. Gurgi, rather than look cute, ended up looking creepy primarily due to his voice. It's impossible now to not hear him as Gollum-Lite. Taran at least has a motivation: to be a great warrior, but that isn't interesting, and he ends up coming across as rather stupid and worthy of being a pig boy. Curiously, while Elmer Bernstein's score was quite good, at times I thought some songs might have actually done the film good. 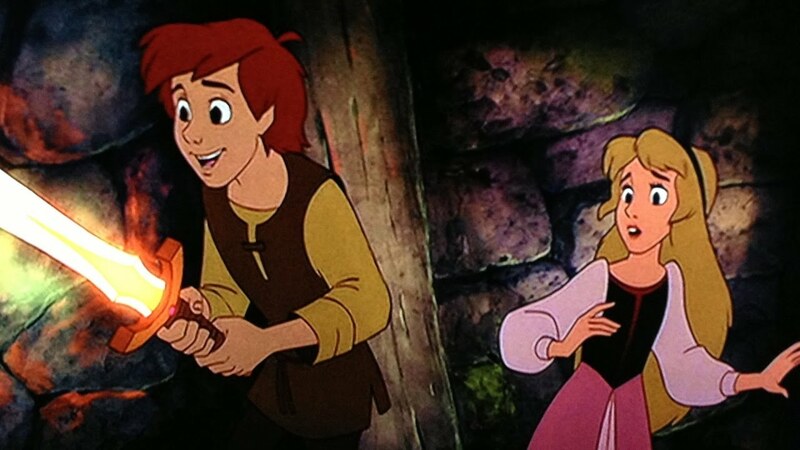 On at least two occasions in The Black Cauldron, I thought Taran was going to break out into song, with the situation actually making such a thing plausible. Granted, Grant Bardsley did a good job in his performance of Taran as a dreamer, but it is Hurt who steals the show as The Horned King. I think they added a little reverb to his tone, but his vocal performance appears to be taking all this seriously. He brought menace to his role, without a hint that he was sending it up or spoofing things. He was a genuine villain, not one playing things for laughs unlike Creeper. The Black Cauldron is a mostly-forgotten film in Disney animation. It isn't ranked among the company's established classics like Snow White & the Seven Dwarfs or Fantasia, or among its Renaissance such as Beauty & the Beast and The Lion King. It is a film that perhaps should be revisited in terms of remake. Back in 1985, something this dark from Disney would have been unthinkable. I think now, however, time has changed enough to where the darkness of The Black Cauldron could work. It didn't here, but that's not to say there aren't possibilities.